Living on a beautiful tropical island sometimes has its trade offs. Everything is so expensive. Living from paycheck to paycheck often leaves practically nothing leftover for entertainment. Especially when you love to eat as much as I do. The bright side is that this island is full of unbelievable natural beauty, most of which you can explore for free. 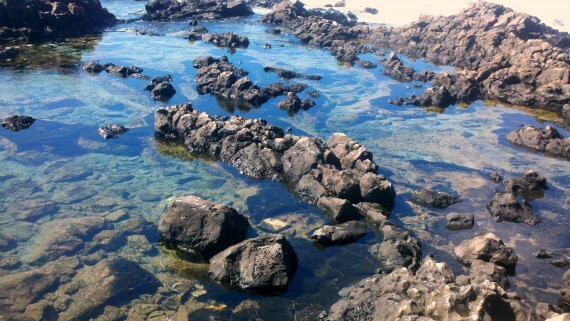 Recently, we visited the tide pools at Makapu’u, and they took my breath away. 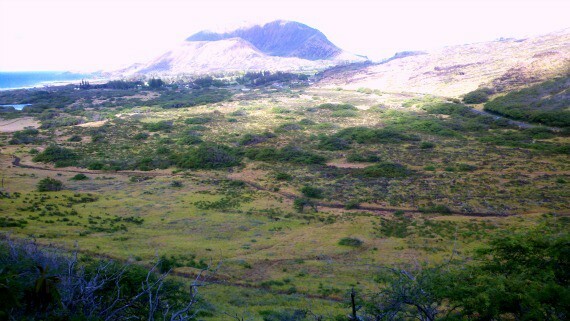 The Makapu’u Point Lighthouse Trail is on the windward side of Oahu near Sea Life Park. 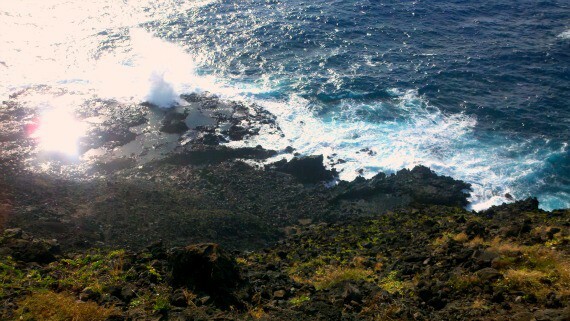 There’s an easy but steep trail that leads to a lighthouse with stunning, expansive ocean views. It’s a great spot for whale watching in the winter months. You can also veer off to the right, if the beach is more you style. On this day, however, we were headed for the tide pools. About halfway up the trail there’s a sign about whale watching. 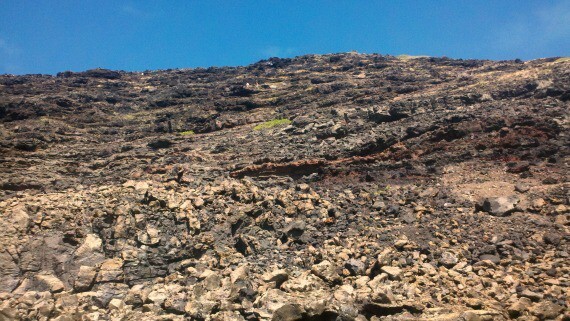 This is where you leave the nice wide paved path and hike down the side of a lava rock cliff. It’s a bit challenging, especially if you’re out of shape like me. There are loose rocks and several places where you have to jump down to the next level. Proper footwear is a definite bonus. I wouldn’t recommend this trail for small children. Also be sure to check the surf report before going out. 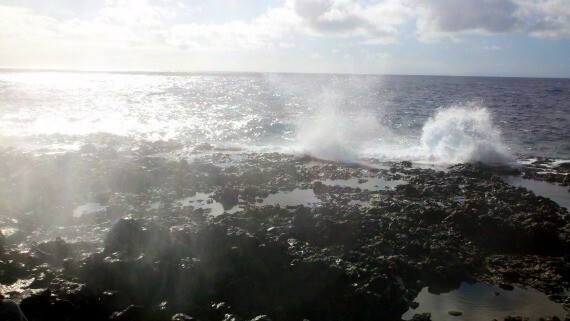 Large waves can rush over the rocks into the tide pools creating dangerous conditions. Even strong swimmers can get swept away. I’m not saying you have to be a scaredy baby, just respect the ocean. It’s a powerful force. 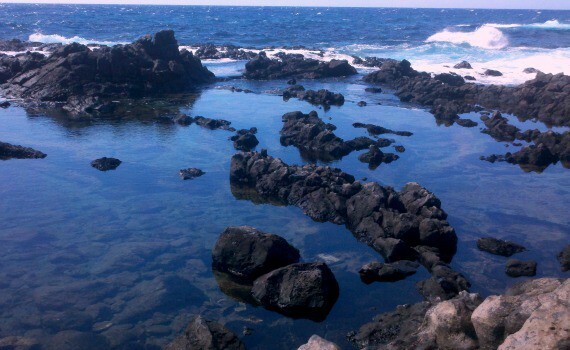 Once you make it down, you’ll see several pools with clear water and adorable colorful fish. You can wade right in with the fish, but remember, you’re in their home. If you have an underwater camera, this would be a fantastic time to use it. The fish will swim right past you. The ocean was putting on a pretty great show for us when we were out there. 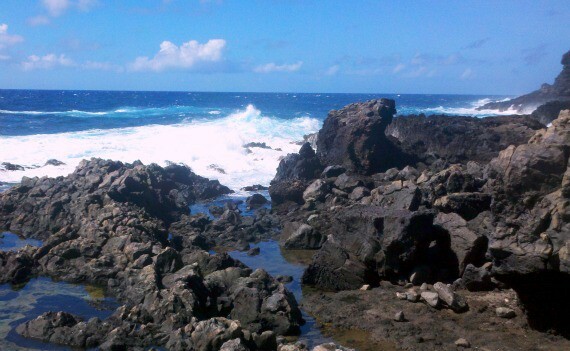 The waves crashing against the rocks, and the sound of the ocean churning beneath the blow holes and in the lava tubes is powerful. Just be careful and don’t turn your back on it. Be sure to bring plenty of sunscreen and water. There’s no shade down there, and once you hike down, you have to get back up. There are chalk arrows on the rocks to guide you on the safest path. There are also no restrooms out here, so…. Well, just be prepared. I love the opportunity to explore new and beautiful places so near my home. A sandwich, some water, and a camera are all you really need to enjoy an awesome day in the natural world. These pictures are absolutely beautiful!! Love! Mahalo! It was twice as wonderful in real life.